After finishing your Techpack, it's time to Preview, Print, or Download in PDF version or Send it to your factory. Simply follow these steps below. 1. Go to the Card Dashboard of your techpack that you would like to preview. Then click on PREVIEW - PDF clipboard icon from the top bar menu (see image below). 2. Also from the card dashboard page, click on > icon to expanded left side sub-menu, then click on PREVIEW - PDF (see image below). All your details and cards that you have created are automatically reformatted as a Techpack. This format follows the industrial standard, so all the information can be clearly communicated and distributed from a different department within a factory. Note: It takes nearly 5 seconds to generate the PREVIEW including annotations and other details. Therefore it's recommended to wait for 5 seconds before you jump to create your PDF. Cards per page (on PDF); by default, the PDF is printed with 2 cards per page, but you can change the layouts to 1 or 6 cards per page. To change the layout, click "Print Options" next to "Create PDF". You can either apply the chosen layout on all cards of techpack OR set different layout for different card type (see image below). Click here to learn more about all printing options and best customize your PDF techpack. Next - Check if all information is correct and click on “CREATE PDF” button (on the top-right corner) to download the PDF version of this techpack. Once you click on “CREATE PDF” button, the file will be automatically downloaded to your preferred folder (in most cases it's Downloads folder). If your preferences allow you to select the folder before you download, then simply select your preferred folder to save your PDF. Once you click on “CREATE PDF” button and the download is completed, a PDF will be opened in a new tab. 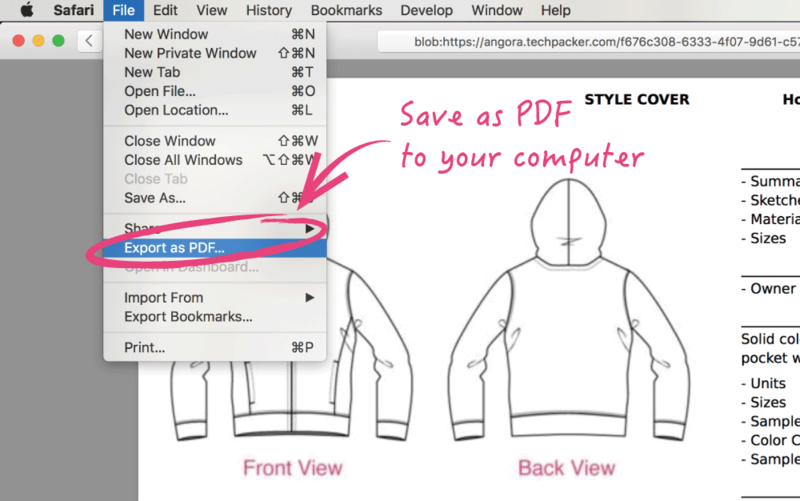 You can simply go to the drop-down menu of “File” and click on the “Export as PDF” to save your Techpack. (see image below). You can also send your Techpack directly to your Factories and colleagues without wasting time in downloading, preparing an email, attaching PDF and sending. All this can be done through techpacker with a click of a button. 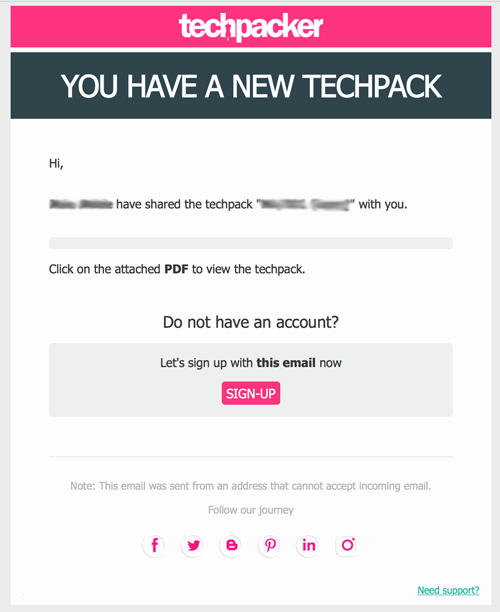 On top of the preview techpack page, simply enter the email address in the box provided and click on " SEND PDF ". You can also write a customized message by clicking on the drop-down box next to “SEND PDF” (see image below). Once done, you will see an alert confirmation and the recipient will receive an email with an attachment. Below is the sample of the email that they will receive. Techpacker automatically maintains the versions of your techpack when you send it through techpacker and at any time you can refer it back. To learn more, read "Techpack Versions" article.